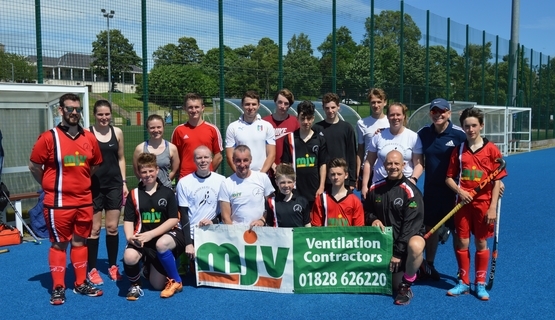 With the sun out and a some fun hockey to look forward to later in the day, first up was a hard training session organised by the club and run by David Stott through his Hockey programme HPC Scotland. The session lasted 1 1/2 hours and had various small game set ups, with the 17 participants split into groups and 3 goals set up for the running of each drill. Everyone was soon realising this wasnt just a nice easy summer session and were soon feeling the effects of a tough drills, but also realising just how enjoyable and effective a training session it was by the end of the morning. a big thank you for David Stott for running this fantastic session, of which there should be others to follow during the summer with other participants being asked along to take part in the sessions. 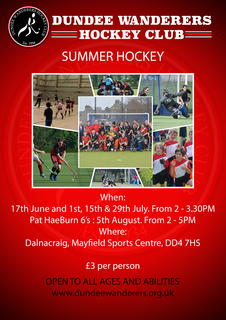 Later on in the afternoon was the turn for the more relaxed and social version of the Hockey in the Sun, down at Dalnacraig we had over 30 Wanderers and some new faces turn up for a run around and enjoy a game or two of hockey, at frist we tried just splitting into a couple of large teams, but soon realised space on the pitch was getting a bit tight. So we eventually split into 3 teams of 10+ and had some short 15 min games against each other, and while watching these games having a few refreshments on the sidelines and having a go at hunt the treasure raffle for one of 2 hocey sticks on offer. Again the day turned out to be fantastic and thoroughly enjoyed by all who turned up, with more dates coming up in the following weeks, keep an eye out for messages on facebook reminding you of the dates and come along again or for first time and hopefullly the Sun will be out once more. Big thanks to Denis & Carmin for organising things and the others who helped get these events and sessions sorted and run.